The Cardoon is a cultivar of the same perennial plant species as Artichoke – Cynara cardunculus. 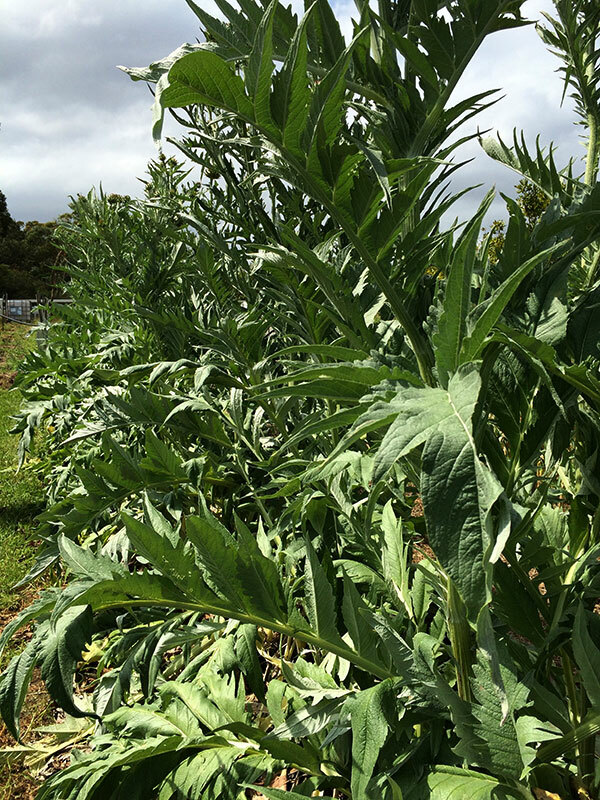 They grow much the same way and in the same conditions however the point of growing the cardoon is to eat the new growth stems. The flowers of the Cardoon are small and unlikely to have much in the way of viable edible material although they can be very attractive. 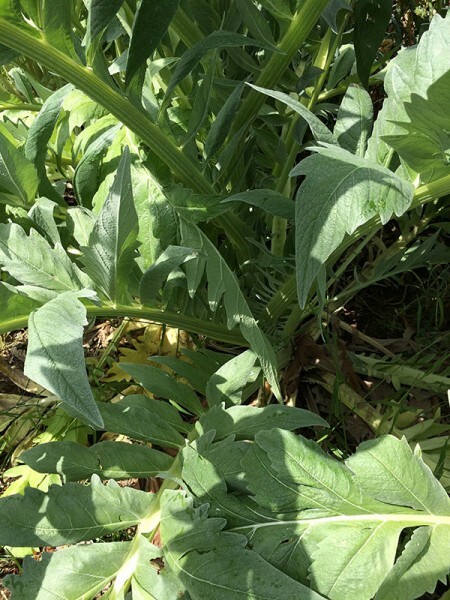 Exactly like Artichokes they regrow with new sprouts from the root each year in early spring – sending out a cluster of multiple new growth points from the root stock and then they usually die back in autumn. And it takes a while from seed to get a nice plump set of new growths on a root. You can easily multiply your plants by cutting off new growths and planting them out. But seed propagation is usually also very easy – just a lot slower to start with. 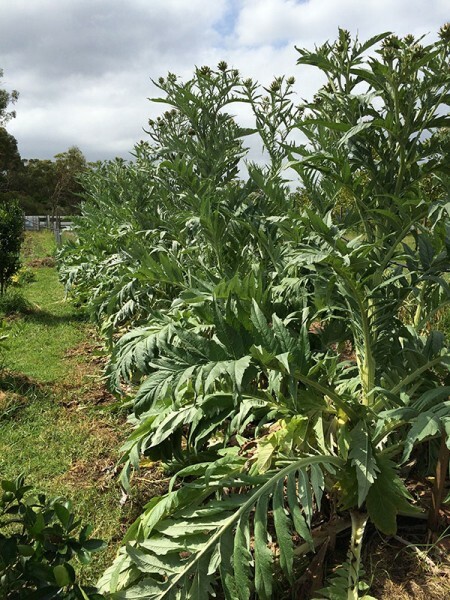 The plants are basically like Artichokes just giant thistles and thrive best and taste best in environments that are sunny, warm and have access to water. However they are also tough and will put up with a lot of neglect. There are several traditional ways to prep the growths for eating – leave it alone and just harvest the fresh new growth like you would a celery stick – push it over as it comes up and heap dirt or straw on it to effectively blanch it – wrap or cover it in some sort of protective cloth or hard wrapping to blanch it – grow it in a dark cellar and let it sprout like a chicory and harvest that. In some places the plants are pulled up for the winter and stored in a cellar to protect them. This makes harvesting the new sprouts in spring easier. To eat the stems you need to strip the strings from the outside of the flesh and usually pre cook or blanch them to remove some of the astringent or bitter initial taste they have. Cut them up into usable sized pieces and simply peel the skin off with a small knife and then just batch them for a while in boiling water. 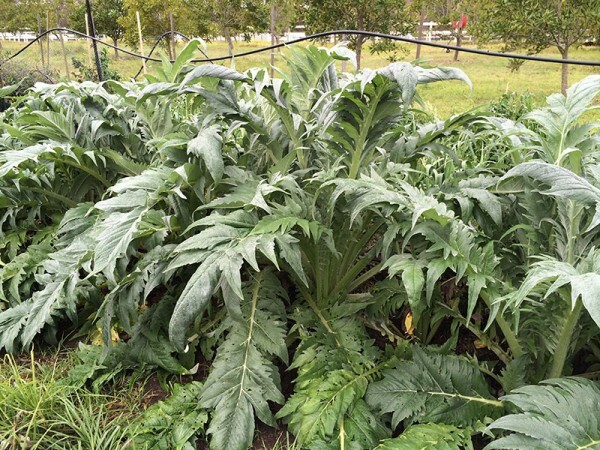 They taste like a cross between artichoke and celery and are very nice to eat as a ‘hearty’ vegetable especially in late winter & early spring when they first emerge. Some people eat the Cardoon leaf stems sliced raw. Personally I find the leaves and stems are pretty unpalatable raw just like artichoke leaves. I have tried gnawing on both before raw – and that is one tasting I choose not to repeat. They are severely astringent and bitter and leave a metallic aftertaste like aluminium foil in your mouth. BUT they do taste good when properly reduced to the main stem and blanched. When you cut them up and prepare them for eating make sure you use acidulated water with some lemon or vinegar added to the water to make sure they don’t brown off too much when you peel them. Here’s a row in late spring starting to flower. Often they will die down during the heat of summer and come back to flower again in Autumn like Artichokes. The flowers are usually fairly small but plentiful. The plants grow very big at flowering time. These ones are about 2.5m high. At this stage I can’t even reach the top to take a photo of the flowers close up. What you are after is good strong growth at the core so that the following year they sprout multiple new growth stems for harvesting. Obviously once you cut the top off it weakens the plant so it’s good to have a strong multi stemmed base to harvest from. The stem base can get up to about 10cm wide by 3-4cm thick so it’s fairly substantial vegetable. Usually when they have about three new strong growths you separate any new ones from the main stem to plant out. This is the same row in mid winter before flowering. Usually in a colder climate they would be sprouting later. In a warmer climate where I am growing these ones they hardly even die back or slow down year round. 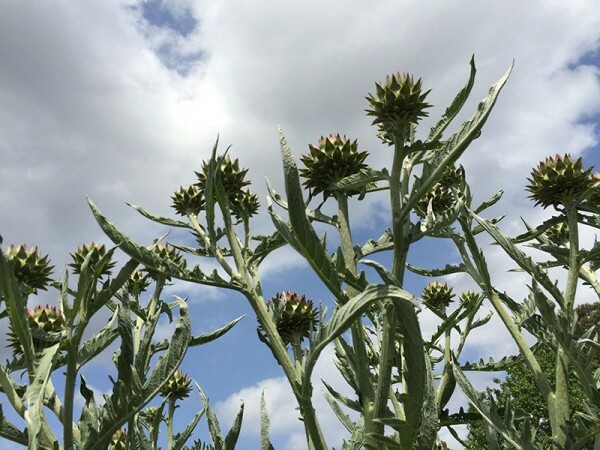 I think they are really impressive looking plants, and very hardy like artichokes, so worth growing just for the architectural effect in your garden if you have the space – even if you don’t want to eat them.